The Cumberland Connector will be getting a new look, revamped routes and a better fare – free – by baseball’s opening day this year. District 2 Commissioner Bob Ott told the Smyrna Business Association in January that following two public hearings he expects changes to be made. The Red route, serving Home Depot’s headquarters, is expected to be terminated. The Green and Blue Routes, currently both from the Cumberland Transfer Station, will be revamped with the Green route clockwise serving the Windy Hill and Interstate North area and the Blue Route serving Cumberland. They will intersect at SunTrust Park. The buses will be rebranded so that they don’t look like Cobblink buses. The operating costs are covered by Hotel-Motel taxes. 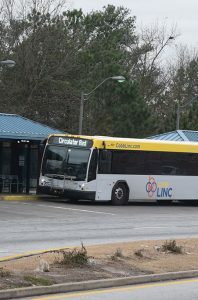 “It will still be operated by Cobblink, but not paid by county dollars,” he said. “These changes will be done before first pitch,” Ott said. SunTrust Park and Battery Atlanta should bring in more money for the county in 2018 than the cost of stadium operations. That was the bottom line of a new analysis unveiled by Ott during a Board of Commissioners Work Session in January. Ott said money generated from the ballpark and development in 2017 came in only $27,210 short of “breaking even” for the county. This was despite the fact the Battery Atlanta development was only 50 percent built out by the end of the year and the Omni Hotel and Comcast Regional Headquarters just opened around the end of the year. Ott says income from the Cumberland Special Service District property tax and hotel/motel fees exceeded expectations. From the February 2018 issue of The Bright Side, Cobb County Georgia’s Newspaper covering Smyrna, Vinings, Mableton, Powder Springs and Austell, GA.